Cutesy 3DS title Fantasy Life has been selling like hot cakes over in Japan with so many copies sold in its first week that the game has reportedly sold out. It's unsurprising then to learn that, during a recent interview with Famitsu, Level 5 has earmarked Fantasy Life as a new franchise for the studio saying it will be made into a fully-fledged series. The game is quite similar to Animal Crossing so it's easy to see why Level 5 see so much potential in it considering Animal Crossing: New Leaf has eclipsed the 2 million sales mark already in Japan - not even Super Mario 3D Land or Monster Hunter 3 G have achieved that feat just yet. Fantasy Life is a collaboration between Level 5 and Brownie Brown that sees you choose a profession and live your life under that role. Players are encouraged to play the game in whichever way they like with each profession leading to various outcomes. There is still no news on a Western release date for the game, however the mammoth first week sales certainly cannot hurt its chances. 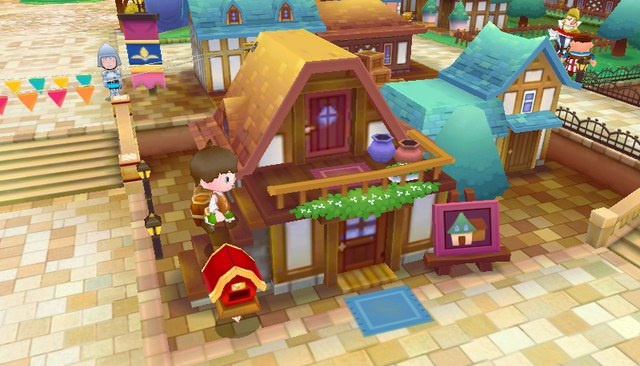 Are you pleased to hear Fantasy Life will be made into a series? Let us know what you think to it all in the comments section below. If it's like Animal Crossing, I might take a look at it. @Magnet_Man018 It is but with combat. I hope it's a great game so Animal Crossing can take some notes from it. There is still a lot of work to be done in this genre. IMO it looks much better and varied than Animal Crossing. I' m actually planning to buy it. I thinks it's bound to replace Professor Layton as their cash cow. And judging from the quality of the Layton series and from the alleged quality of Fantasy Life, I think it probably deserves it. Since it's developed by brownie brown to, is there any chance that nintendo owns, say 25% of the IP? I would very much like to see this series released in the West. Most things Level 5 is a buy for me. Yes, but only if it comes to NA! I was addicted to animal crossing for years. Hopefully this game doesn't do the same thing to me as that one did. Still, I'm kinda excited!!! I'm glad its doing so well, but I'm not a fan of the art direction they went with after starting the game over from scratch. The style they had used when they were making this in tandem with London Life from Prof. Layton looked so much more appealing to me. When I see commercials on TV for this game I swear I can never tell it apart from the Animal Crossing adverts. This appeals more to me than Animal crossing..its more anime and that's how I like it. I am so preordering this when it is available at gamestop. Between this and Animal Crossing alone (and maybe even Harvest moon:ANB), oh my god I'll be playing those for a along time. My poor 3DS might actually wear out from so much use. This is the sorta game I always wanted as a kid, one where I could basically live another life and pretend to be the character. I read a preview of this game in ONM and saw the various youtube videos. Looks quite promising. In fact, I think it'll have a bit of a cult following in the West. Not as much as Animal Crossing, but there will be a following I predict. Come on, Level-5. GIVE US IT. Seriously hope it makes it here. If it gets to the US we usually get it in Canada so let's hope it does. The game looks really cool. Japan got really great games. I'd love to go there someday and more to actually learn japanese language like I learned english....eee yeah I'm french you see so ee yeah. Happy to know this is doing so well, really hope it's coming stateside. This game looks incredible almost as if it were a mixture of Animal crossing and what Dragon quest 9 was originally going to be with real time battles.